Description: BNSF 6091 leads a 137 car WB GRDX past the waiting "LINEBACKERS"
Description: WB GRDX has cleared the Aurora X over,A Green signal is seen and lights on. Description: The WB GRDX has cleared and the LINEBACKERs ease the slack out the train. Description: No junk on this train! NS 736 with an unusual leader. Description: NS 736 has a different leader today. Glad to see the EMDs take the lead. Couldn't get a perfect trifecta tho, the DPU was a GE. Description: CN 765 shoves into the yard. Description: CN 765 pulls out of the yard. Description: NS 416 power takes the wye to turn the power so the cab signal SD40-2 can lead on the westward trip. 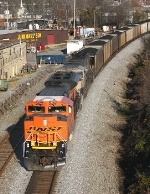 Description: Part of a BNSF consist that brought in a PRB coal for ADM. 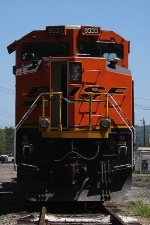 Title: BNSF 9333 NS 735? Description: BNSF SD70ACe bringing up the rear of NS 735? as its DPU. Description: Empty taconite ore train (U-MADALL) heads through Walshville, IL with brand new ES44C4 # 6960. Title: BNSF 9015 Leads a empty Slc. Description: NB empty coal train. Ripping up the K line into Old Monroe Mo. Description: Rear DPU ACe pushing empty coal out of Delta Yard towards Lowell. Description: Rear ACe DPU with empty coal at Delta Yard. Description: ACe DPU pushing empty coal into Lowell.